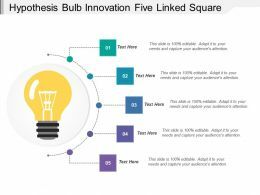 Presenting this set of slides with name - Hypothesis Bulb Innovation Five Linked Square. This is a five stage process. 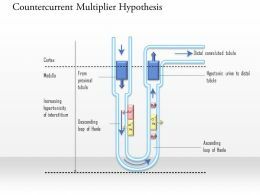 The stages in this process are Theory, Hypothesis, Thesis. Presenting this set of slides with name - Hypothesis Likely Region Non Likely Region Chart. This is a two stage process. The stages in this process are Theory, Hypothesis, Thesis. 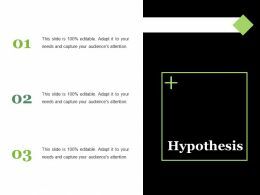 Presenting this set of slides with name - Hypothesis Ppt Slides Template. This is a three stage process. The stages in this process are Business, Management, Marketing, Strategy, Planning. 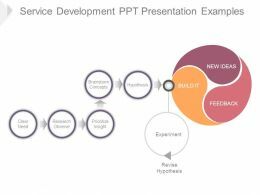 Presenting technical procedure good powerpoint templates. 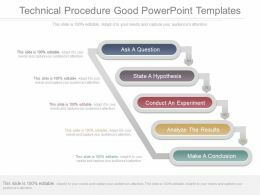 This is a technical procedure good powerpoint templates. This is a five stage process. The stages in this process are ask a question, state a hypothesis, conduct an experiment, analyze the results, make a conclusion. 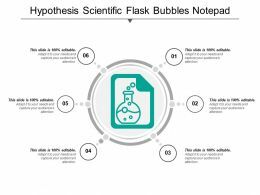 Presenting this set of slides with name - Hypothesis Ppt Powerpoint Presentation File Diagrams. This is a three stage process. The stages in this process are Hypothesis, Business, Management, Marketing, Analysis. 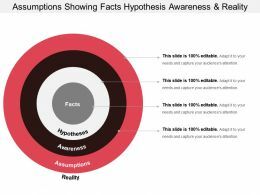 Presenting this set of slides with name - Assumptions Showing Facts Hypothesis Awareness And Reality. This is a four stage process. The stages in this process are Belief, Expectation, Assumptions. 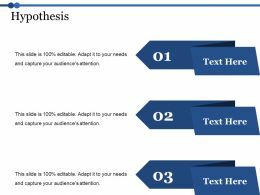 …ppt powerpoint slides template. 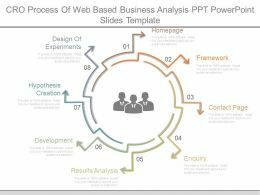 This is a cro process of web based business analysis ppt powerpoint slides template. This is a eight stage process. The stages in this process are design of experiments, hypothesis creation, development, results analysis, enquiry, contact page, framework, homepage. 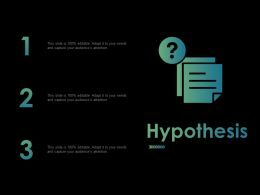 Presenting this set of slides with name - Hypothesis Idea Generate Reject Design Accept Acquire. This is a six stage process. The stages in this process are Theory, Hypothesis, Thesis. 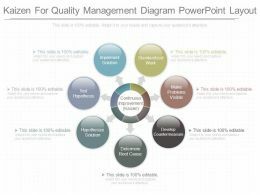 …a kaizen for quality management diagram powerpoint layout. This is a seven stage process. 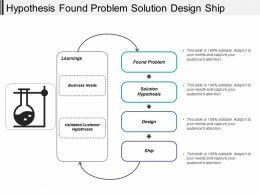 The stages in this process are standardized work, make problems visible, develop countermeasure, determine root cause, hypothesize solution, test hypothesis, implement solution, continuous improvement kaizen. 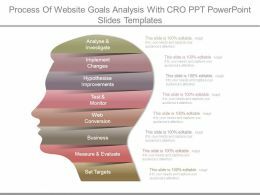 …This is a process of website goals analysis with cro ppt powerpoint slides templates. This is a eight stage process. The stages in this process are analyse and investigate, implement changes, hypothesise, improvements, monitor, text and web, conversion, business, measure and evaluate, set targets. Presenting new thought and logic template ppt sample presentations. 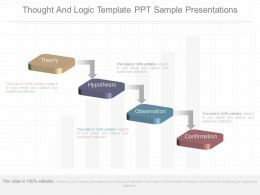 This is a thought and logic template ppt sample presentations. This is a four stage process. The stages in this process are theory, hypothesis, observation, confirmation. …analysis diagram presentation layouts. 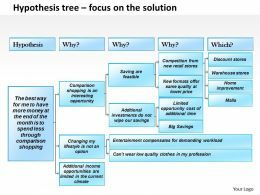 This is a cro for online business analysis diagram presentation layouts. This is a six stage process. 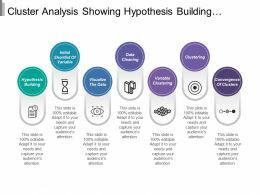 The stages in this process are gather insights, measure, form hypothesis, form hypotheses, gain insights, study user behaviour, conversion rate optimization. Presenting this set of slides with name - Hypothesis Ppt Example. This is a three stage process. The stages in this process are Business, Marketing, Strategy, Planning, Process. 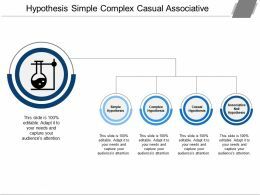 Presenting this set of slides with name - Hypothesis Simple Complex Casual Associative. This is a four stage process. The stages in this process are Theory, Hypothesis, Thesis. 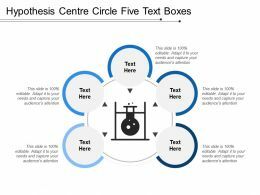 Presenting this set of slides with name - Hypothesis Centre Circle Five Text Boxes. This is a five stage process. The stages in this process are Theory, Hypothesis, Thesis. 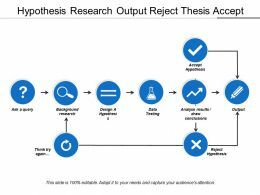 Presenting this set of slides with name - Hypothesis Research Output Reject Thesis Accept. This is a one stage process. The stages in this process are Theory, Hypothesis, Thesis. 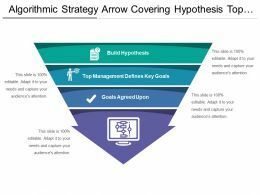 Presenting this set of slides with name - Algorithmic Strategy Arrow Covering Hypothesis Top Management Goals. This is a four stage process. The stages in this process are Algorithmic Strategy, Algorithmic Plan, Algorithmic Approach. 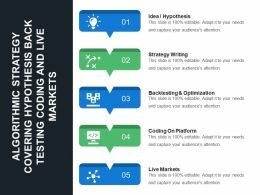 Presenting this set of slides with name - Algorithmic Strategy Covering Hypothesis Back Testing Coding And Live Markets. This is a five stage process. The stages in this process are Algorithmic Strategy, Algorithmic Plan, Algorithmic Approach. Presenting this set of slides with name - Cluster Analysis Showing Hypothesis Building Variable Convergence Data Cleaning. This is a seven stage process. The stages in this process are Cluster Analysis, Cluster Examination, Cluster Investigation. 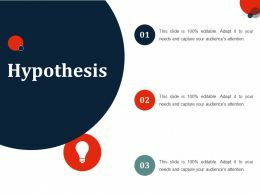 …need analysis for cro example of ppt. 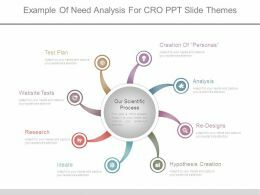 This is a example of need analysis for cro example of ppt. This is a eight stage process. The stages in this process are creation of personas, analyze, hypothesis creation, re designs, eyetrackig, copy writing, test plan, website tests, our scientific process. 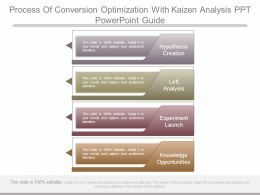 …of conversion optimization with kaizen analysis ppt powerpoint guide. 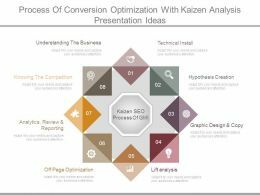 This is a process of conversion optimization with kaizen analysis ppt powerpoint guide. This is a four stage process. The stages in this process are hypothesis creation, left analysis, experiment launch, knowledge opportunities. 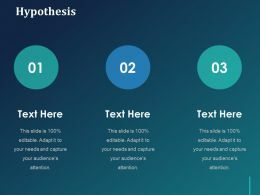 …of need analysis for cro ppt slide themes. 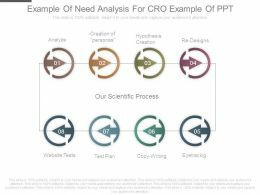 This is a example of need analysis for cro ppt slide themes. This is a eight stage process. The stages in this process are creation of personas, analysis, re designs, hypothesis creation, ideate, research, website tests, test plan, our scientific process. 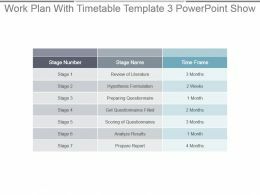 …with timetable template 3 powerpoint show. This is a seven stage process. The stages in this process are stage name, stage number, time frame, hypothesis formulation, review of literature, preparing questionnaire, get questionnaires filled, scoring of questionnaires, analyze results, prepare report. 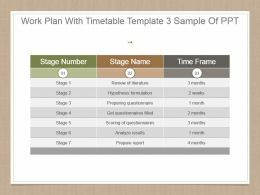 …This is a work plan with timetable template example of ppt presentation. This is a seven stage process. The stages in this process are review of literature, hypothesis formulation, preparing questionnaire, get questionnaires filled, scoring of questionnaires, analyze results, prepare report. 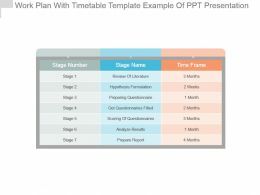 …with timetable template 3 sample of ppt. This is a seven stage process. The stages in this process are stage number, stage name, time frame, review of literature, hypothesis formulation, preparing questionnaire, get questionnaires filled, scoring of questionnaires, analyze results, prepare report. 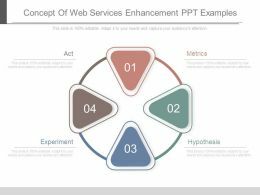 Presenting pptx concept of web services enhancement ppt powerpoint templates. This is a concept of web services enhancement ppt powerpoint templates. This is a four stage process. The stages in this process are act, experiment, metrics, hypothesis. 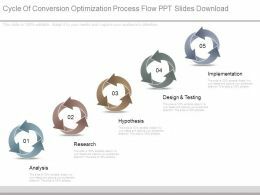 Presenting sample of conversion optimization skills ppt sample file. 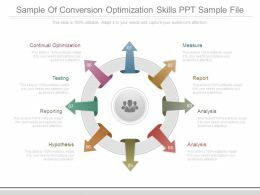 This is a sample of conversion optimization skills ppt sample file. This is a eight stage process. The stages in this process are measure, report, analysis, hypothesis, reporting, testing, continual optimization. 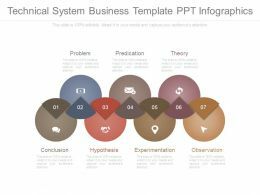 Presenting technical system business template ppt infographics. This is a technical system business template ppt infographics. This is a seven stage process. The stages in this process are Problem, Predication, Theory, Conclusion, Hypothesis, Experimentation, Observation. 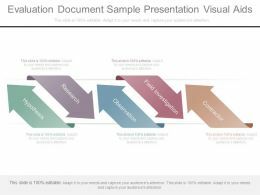 Presenting evaluation document sample presentation visual aids. This is a evaluation document sample presentation visual aids. This is a five stage process. The stages in this process are hypothesis, research, observation, field investigation, contractor. 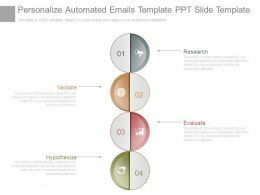 Presenting personalize automated emails template ppt slide template. 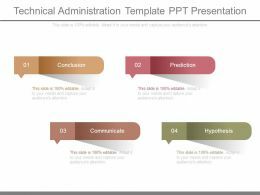 This is a personalize automated emails template ppt slide template. This is four stage process. The stages in this process are research, validate, evaluate, hypothesis. Presenting investigative approach diagram sample presentation ppt. 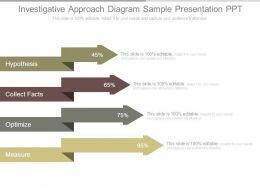 This is a investigative approach diagram sample presentation ppt. This is a four stage process. The stages in this process are hypothesis, collect facts, optimize, measure. 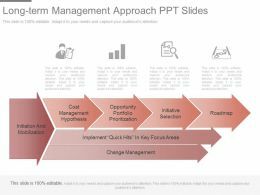 …long term management approach ppt slides. This is a long term management approach ppt slides. This is a seven stage process. 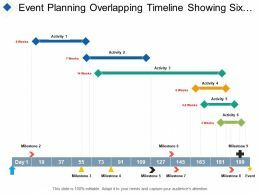 The stages in this process are cost management hypothesis, opportunity portfolio prioritization, initiative selection, roadmap, change management, initiation and mobilization. 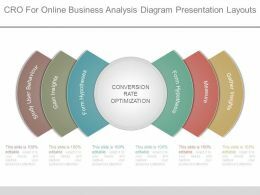 …optimization for web business roi ppt powerpoint images. 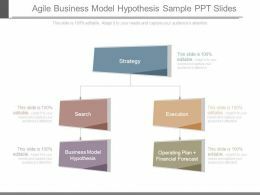 This is a example of lean optimization for web business roi ppt powerpoint images. This is a four stage process. 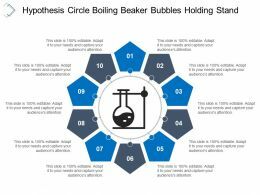 The stages in this process are create variation ideas, continuously a b test, measure results and learn, formulate a hypothesis. 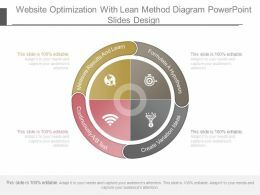 …of lean optimization for web business roi ppt images gallery. 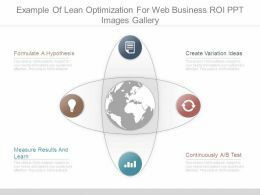 This is a example of lean optimization for web business roi ppt images gallery. This is a four stage process. The stages in this process are formulate a hypothesis, create variation ideas, continuously a b test, measure results and learn. …editing. Absolutely editable color scheme and contrast of PPT icons as per your requirement. Fully modifiable size and orientation of presentation infographics to your liking. Add this slide anywhere within your own presentation. The stages in this process are metrics, hypothesis, experiment, act. 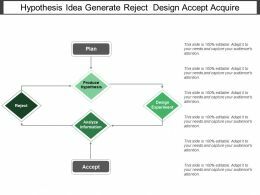 …with lean method diagram powerpoint slides design. This is a website optimization with lean method diagram powerpoint slides design. This is a four stage process. 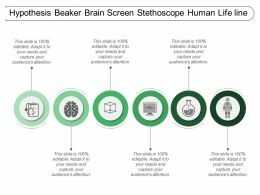 The stages in this process are measure results and learn, formulate a hypothesis, continuously a b test, create variation ideas. 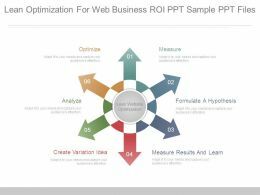 …web business roi ppt sample ppt files. This is a lean optimization for web business roi ppt sample ppt files. This is a six stage process. 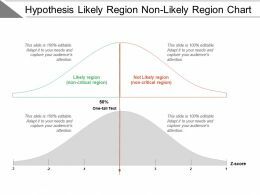 The stages in this process are measure, formulate a hypothesis, measure results and learn, create variation idea, analyze, optimize, lean website optimization. 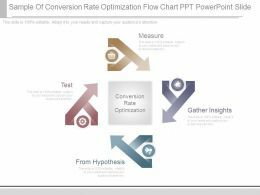 …sample of conversion rate optimization flow chart ppt powerpoint slide. 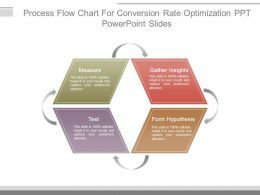 This is a sample of conversion rate optimization flow chart ppt powerpoint slide. This is four stage process. 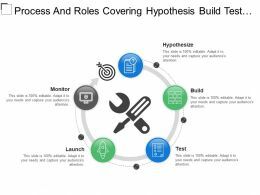 The stages in this process are measure, gather insights, from hypothesis, test, conversion rate optimization.